Providing access to arts and culture for people with disability or a lived experience of mental illness is at the heart of what we do. Working within a Community Arts and Cultural Development (CACD) framework, DADAA is a leading arts and health organisation that creates access to cultural activities for people with disability or a mental illness. DADAA offers targeted programs that include a broad range of traditional and new media projects in Western Australian communities. Our programs range from entry-level workshops for those with no arts experience to professional mentorships for advanced artists. Exhibition or broadcast of works is an outcome of most programs. DADAA has three arts and community centres – in Fremantle, Midland and Lancelin. Working in partnership with local governments and other organisations, this place-based approach creates environments that are welcoming to artists and audiences, and activates local urban, regional and rural spaces. 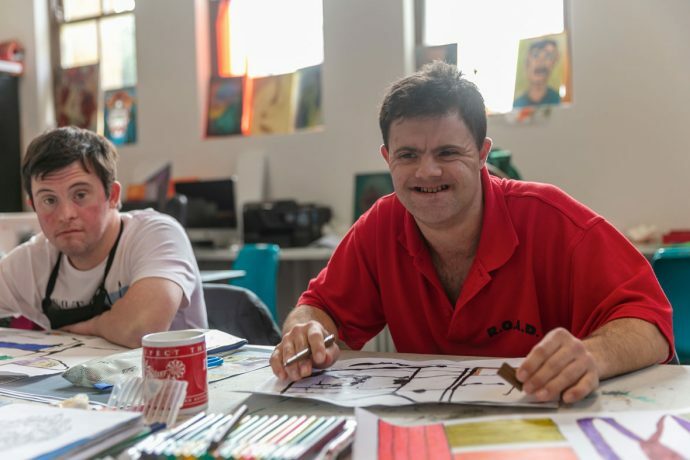 In addition to our three hubs, DADAA works throughout the community by offering arts activities in venues such as the Midland Junction Arts Centre, State Theatre Centre of WA, supported accommodation for people with high-support needs and other urban spaces. We have an audio description service that travels to Perth’s major festivals and cultural events, and consultancy services in disability awareness training designed and delivered collaboratively with organisations across Perth. DADAA is an NDIS-registered provider, and we encourage NDIS participants to enrol in our programs. We follow the NDIS-based approach that enables people with disability to exercise choice and control in their lives. As a professional arts organisation, this means that we offer highly individualised goal planning and promote a culture of disability-led practice in the arts. Facilitating access to and participation in society for artists with disability is fundamental to what we do and how we work. DADAA works through significant local and cross-sector partnerships that bring arts and health together in a way that effectively responds to the needs of communities. DADAA also works actively in state and national audience development, disability advocacy, accessible programming, digital inclusion, and research and evaluation.